Michel Didym takes on a classic for the first time in his career. He has chosen Molière and his Imaginary Invalid, and put together a fine cast on Friday 7 December 2018, 20.30, Théâtre Princesse Grace. 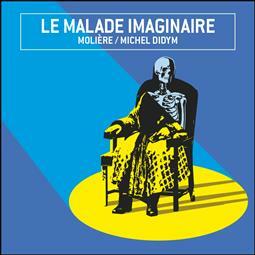 All the darkness and depth of Molière’s masterpiece are revealed in this production. Despite the humorous tone, there is a chilling clairvoyance to Molière’s play that emphasises the folly of humanity, as Argan seeks refuge in medicine, in much the way that others might turn to religion. Michel Didym’s interpretation of this classic sends a shiver down the spine, in view of current events. It instinctively inspires laughter, but the mirth often freezes, leaving the theatregoer with a somewhat curious impression when the curtain comes down. Molière and the Age of Enlightenment were precursors, claiming the right to mockery and caricature as early as the 17th century.